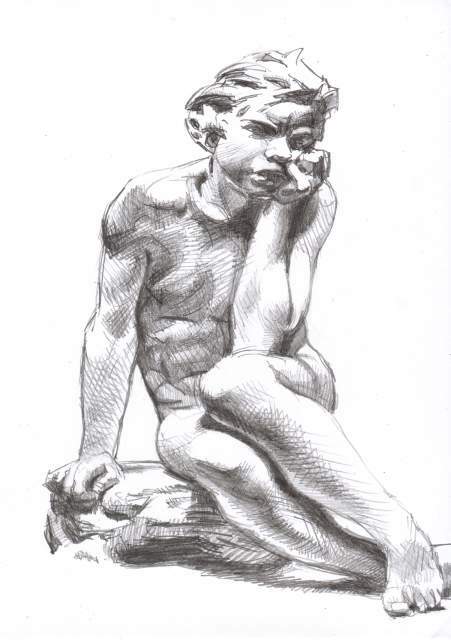 This drawing comes from a photo in my reference file of a sculpture by Teixeira Lopes titled “The Boyhood of Cain.” I liked the lighting on it, and the strong pose of an anguished child. The size of the drawing is 7.5 x 11 inches, drawn in graphite. Frank Godwin was a fantastic illustration artist across all levels of the profession including books, magazines, posters, and comics. 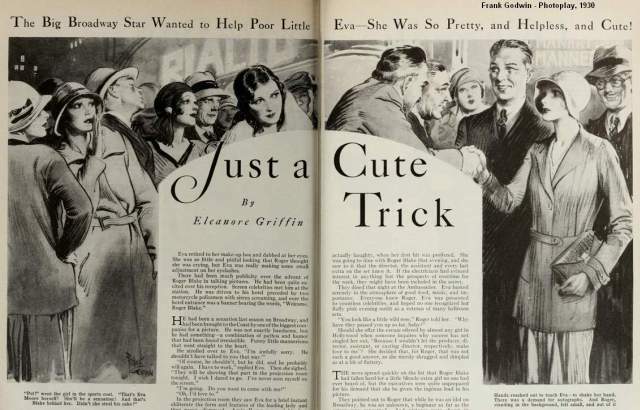 He started his career in the 1910’s, and passed away in 1959 when he was still working on his great comic strip “Rusty Riley.” One particular location that he drew about was Hollywood, something I only recently discovered. 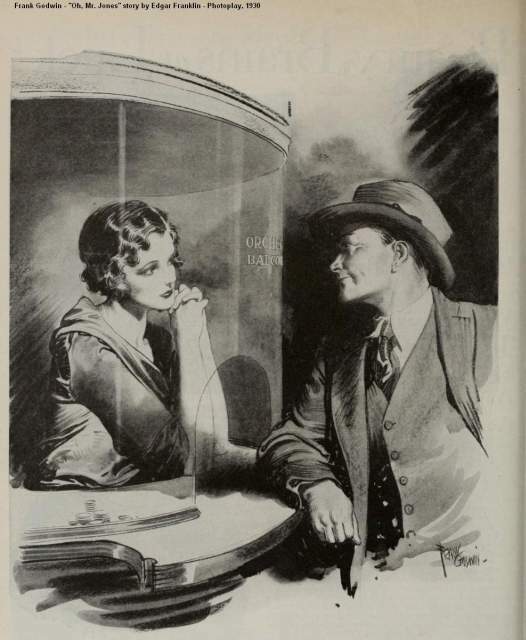 While scanning online through some old issues of Photoplay magazine, I came across several issues that used his illustrations for fictional stories they ran from around 1926 until at least 1938. All these had the subject and setting of people trying to make it big in films. Godwin was a close friend of James Montgomery Flagg, himself a director and actor in the early days of films. He apparently moved around quite a bit, but I don’t see any evidence that he had settled in California at all, so I suppose these were all done at some distance from the locations. 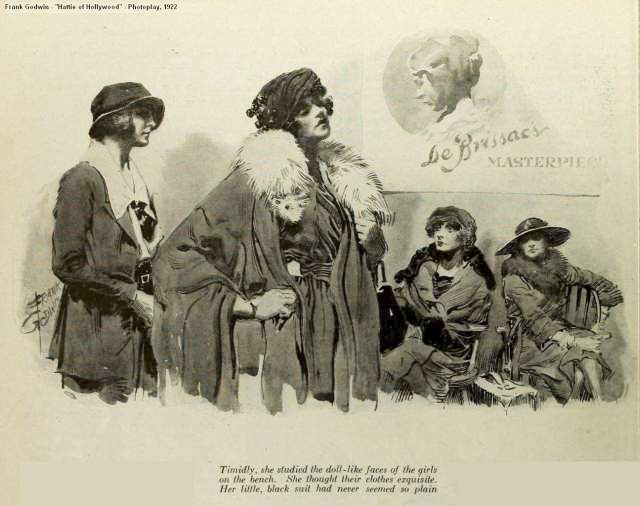 However, in one Photoplay article he wrote how he tried his hand at acting, but found he was better suited to acting out on paper, fortunately for us. I sketched this one while sitting by a local motel swimming pool. A man and woman were having a long conversation, and while he seemed to be trying to make a serious point, she kept stretching her legs and pointing her toes, as though not paying that much attention. 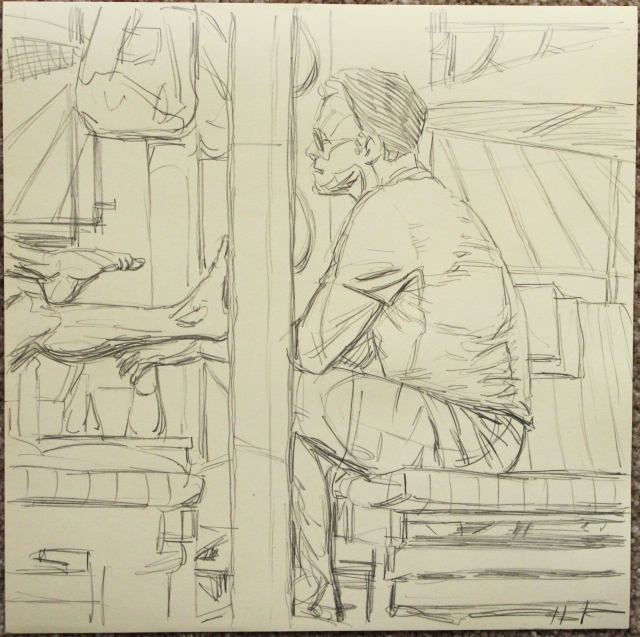 The paper is about 12 inches square, drawn in graphite. Lately I’ve been obsessed with browsing online libraries, and discovering some buried treasures of old illustrated books and magazines. For the most part, that has been the result of my just stumbling onto them by accident, so I thought I’d share a recent success story with you so you would have an easier time of it than I did, should you be interested in such things. The big surprise I discovered recently is the EBSCO system, which is an online service provided to libraries and businesses to access books, journals and periodicals. In order for the general public to gain access, they need to be a member of those institutions, such as a local library that has an eBook service. At that point, all you need is a library card. EBSCO has hundreds of different databases and thousands of books and magazines online. The way I stumbled upon all of this was trying to find information about a 1951 Saturday Evening Post story written by Michael Fessier to go with a picture I had by the illustrator Edwin Georgi called “The Prying Professor.” A Google search gave me a link to that actual story, but I could only access it through a library system. On the right side of this link you should see a list of libraries in your area that are part of the EBSCO system. Click on “Read the article” to bring up a screen that allows you to modify that search. You’ll next be asked to enter your library’s online information. I found it even easier to access this directly through my local library’s website, so I’d recommend first looking on the above link to see if your library is on their system, and then use your library site to get you into the EBSCO databases. You should then get to a screen with the search link below. 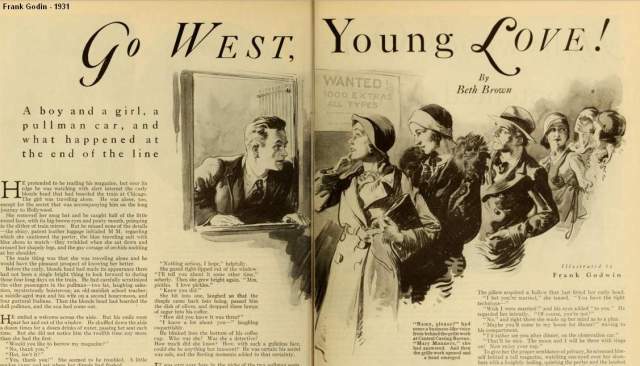 At first, when I entered “saturday evening post” the result was only a few links that my local library itself had online, but when I selected “Choose Databases” and selected all of them, it blew my mind! 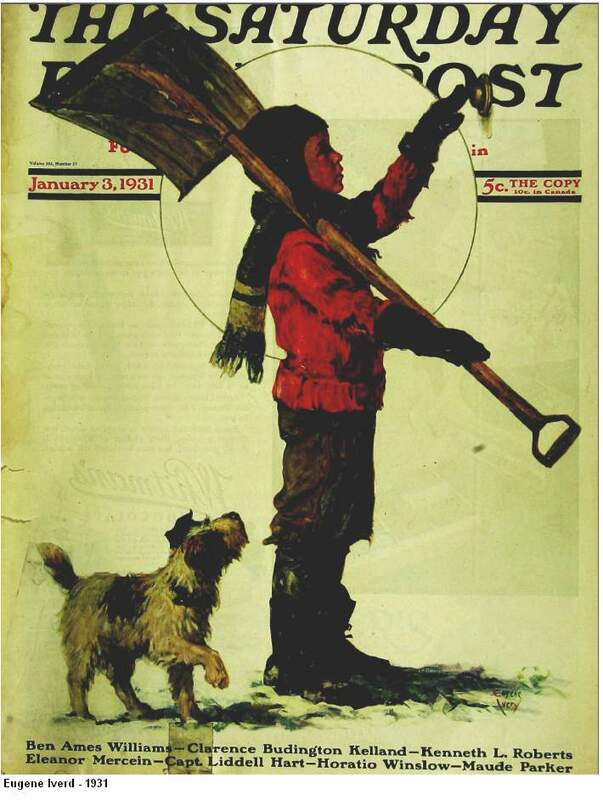 I got access to ALL Saturday Evening Post magazine scans in their database going back as far as January 1931. Not just the covers, mind you, but every page of the magazine. While the resolution of the scans could be higher, they’re better than I expected. 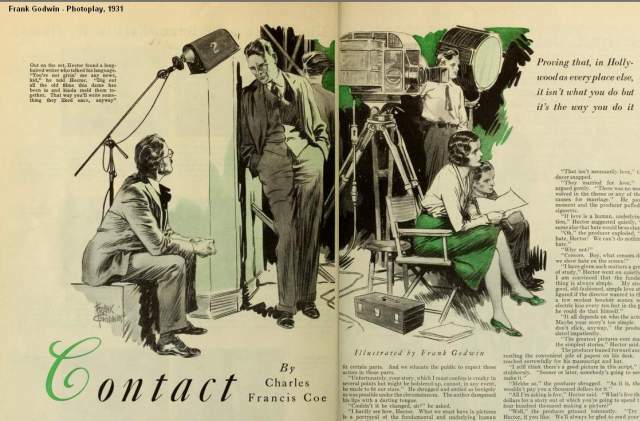 The scan of the 1931 magazine cover (below) is dark, but that might be due to the condition of the magazine itself, or there may be other scans in their system that are better. 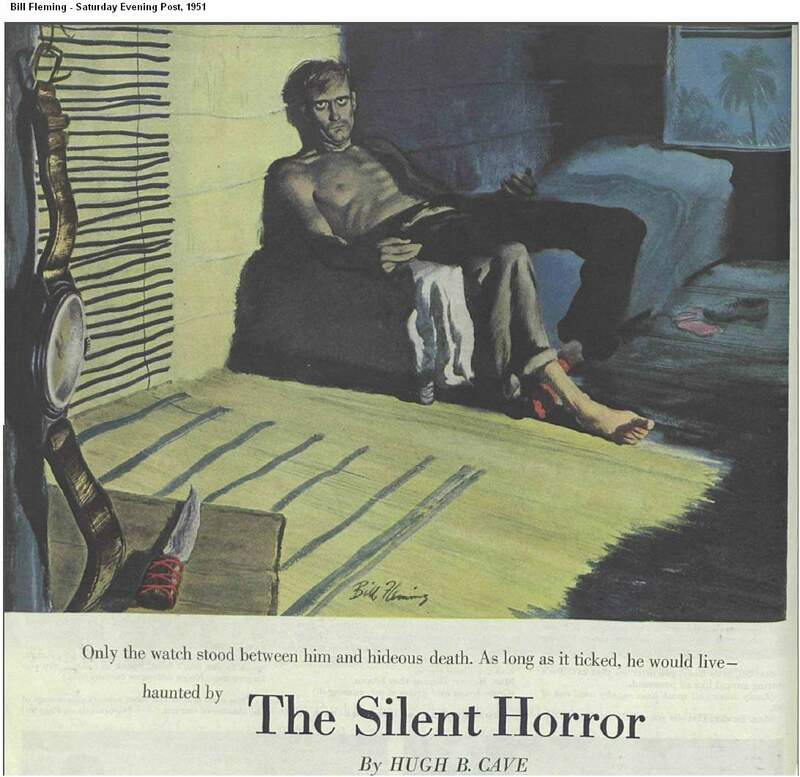 Some other issues I’ve seen are scanned very clearly, such as the Bill Fleming interior illustration below. The Post didn’t use the best quality of paper stock to begin with, so you can’t blame the scanner. All the files are in PDF format with each individual article listed as an unique PDF file that can be read online or downloaded. 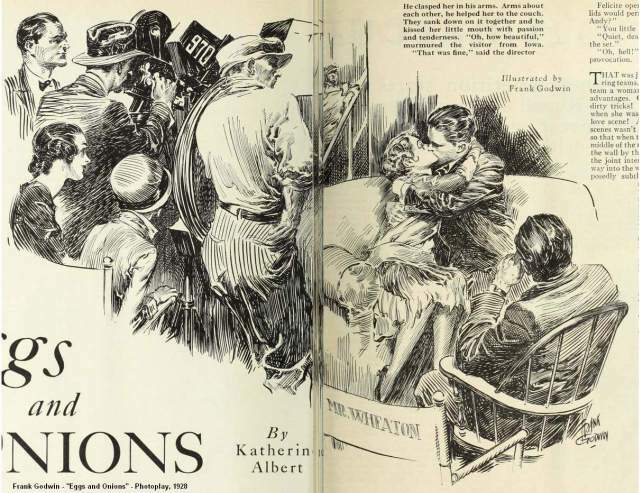 I’ll have to play around in their system a bit more to see if I can go back even further to older Post issues, since they started publication in 1897, as well as seeing what other books and magazines they have. Their online PDF viewer is cumbersome to navigate, and manipulating the search results is a bit awkward, but the results are worth the effort. As with most library searches, it helps to know what you’re looking for before you begin. These files are locked out of regular search results that you would use otherwise, such as Google, so have at it and enjoy! Get yourself a library card, if you don’t have one already, and start digging. If you’re like me, you’ll wonder where the day went. Here’s a new sketch made while sitting at a local insurance office. I quickly sketched one of the agents across the room while waiting for my appointment, and then later finished it up a bit more. It’s 8.5 x 11″ drawn with a Micron marker. 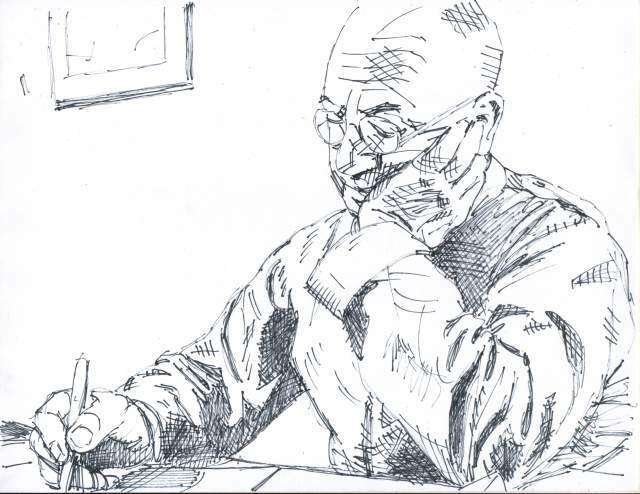 You are currently browsing the Artwork by D. B. Clemons blog archives for August, 2013.